Ever wanted to learn how to make beautiful cards with watercolour? 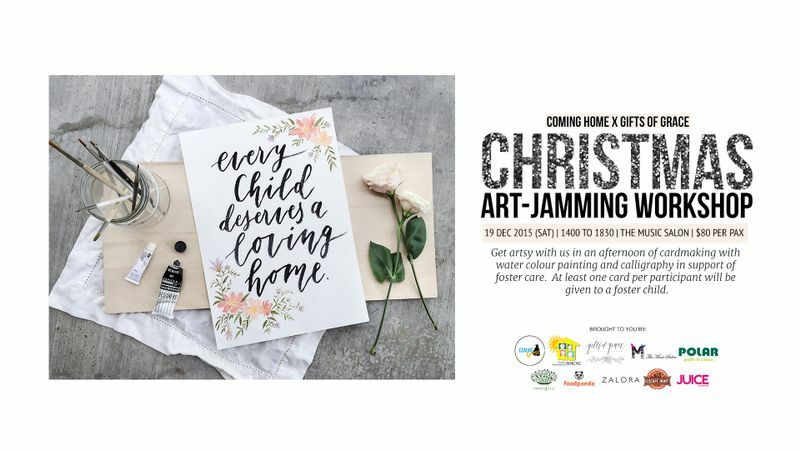 Coming Home invites you to our Christmas Art-Jamming Workshop, where participants will get a chance to learn watercolour painting for a good cause! In this two-hour Christmas watercolour card-making workshop, conducted by local artist Charis from Gifts of Grace Design, you'll learn how to write letters and words with a brush, as well as the basics of watercolour painting, including watercolour washes and simple floral designs. Experts from MCYC Community Services Society (MCYC), a fostering agency appointed by the Ministry of Social and Family Development (MSF) will also share about foster care during the workshop. For just $80 (usual price $140! ), you'll get to keep all the materials used during the workshop, which include a basic watercolour paint set, two paintbrushes, watercolour bucket/container, mixing palette/tray, sketching paper and watercolour paper. At least one card from each participant will be given to a foster child under the care of MCYC. Delicious tea-time snacks from Polar Puffs & Cakes will also be provided during this afternoon of creative fun at The Music Salon!